Sorry to be so long from blogging. I've been enjoying the great progress Peggy has made on Sarcoph A. Gus. Thought I would take this time to catch up from my trip to California. 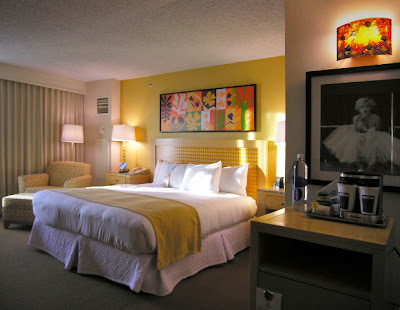 You will read about it in the February 2010 e-newsletter, but I'm going to share some more photos with you. Here's a panoramic view from the Hotel I stayed at in Glendale, CA. Talk about a room with a view! My first Teaching Destination was at Needle In A Haystack/Montrose, CA. 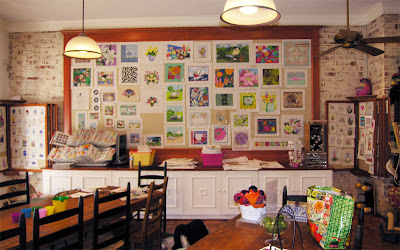 Jody Budman is the owner of this wonderful Needlepoint/Knit Shop. I taught the NeedleDeeva Heart #150G. A great time was had by all. I met Jody's husband and their daughter-in-law. Nice, nice people! They really made me feel at home. 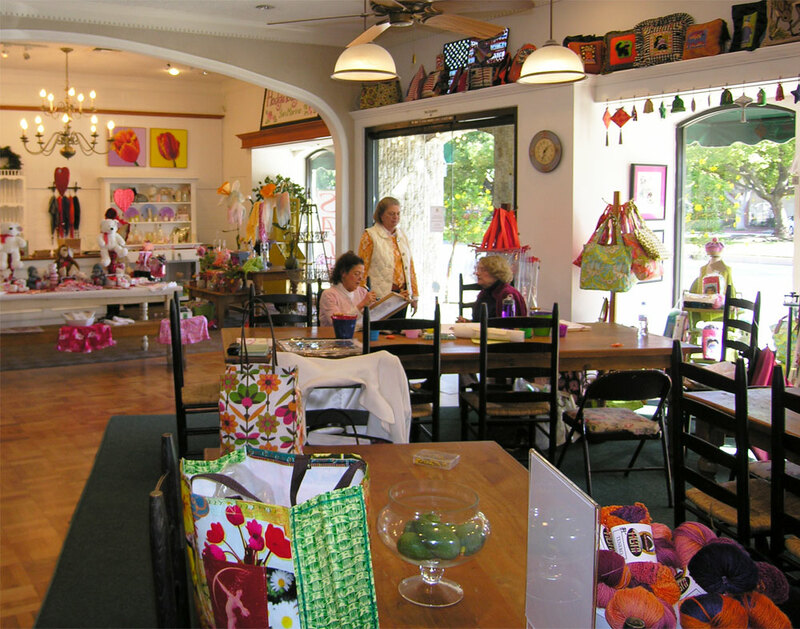 My second Teaching Destination was at A Stitch In Time Needlework/San Marino, CA. Alison Hodgkiss is the owner of this wonderful Needlepoint/Knit Shop. I taught the Early Bird (Zecca ZE-107) at 3PM and the Harvest Fairy (MSD DM-09) after dinner. All of the ladies were very kind. Nice, nice people. Here are two photos of her shop. Yes, I was in sunny Southern California. I was able to preview the new upcoming Kelly Clark's Little Witches which will begin as an exclusive from A Stitch In Time Needlework. Look for their Needlepoint Now ad announcing the series this summer. Seeing Alison's designs and stitches makes me want to sign up for this club. I had the best time at both of these locations. It was a dream come true. I have been talking with other needlepoint Shop Owners about teaching at their locations for 2011 and 2012. Exciting times, indeed. 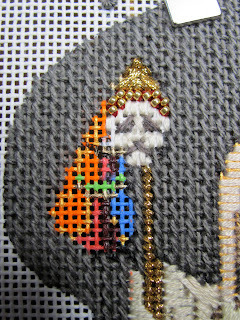 Did you know I have been stitching the NEW NeedleDeeva Halloween Club pieces which will be released in June 2011 with my Stitch Guides? Yes, I am. Woohoo! There are 8 new designs; cute, cute, and more cute. I'll be sharing these previews with you first. 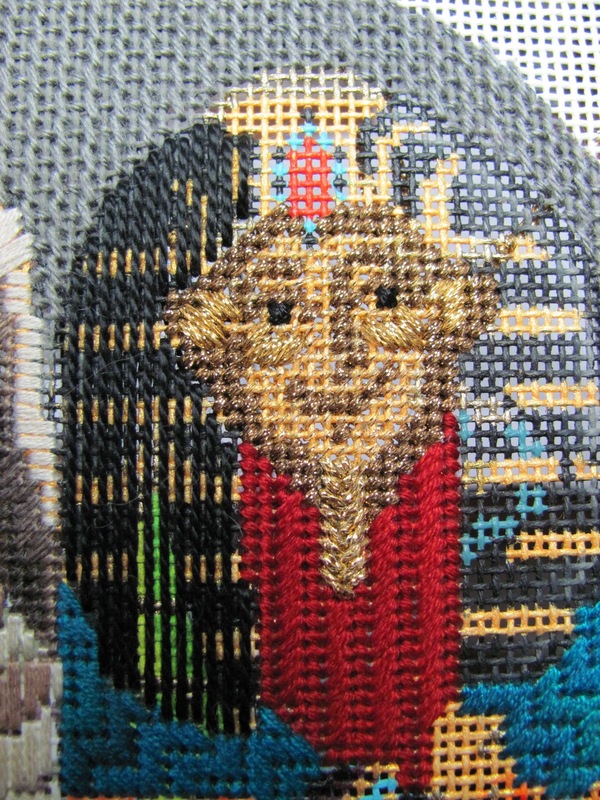 (Another bonus for following the Needlepoint Study Hall blog.) 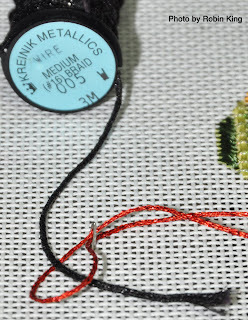 I also have been looking at the new Kreinik Hot-Wire and found some places to use it on these Halloween Club pieces. 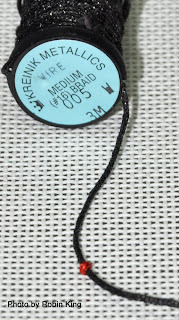 It is the Kreinik size 16 Braid with a wire center. Too fun. 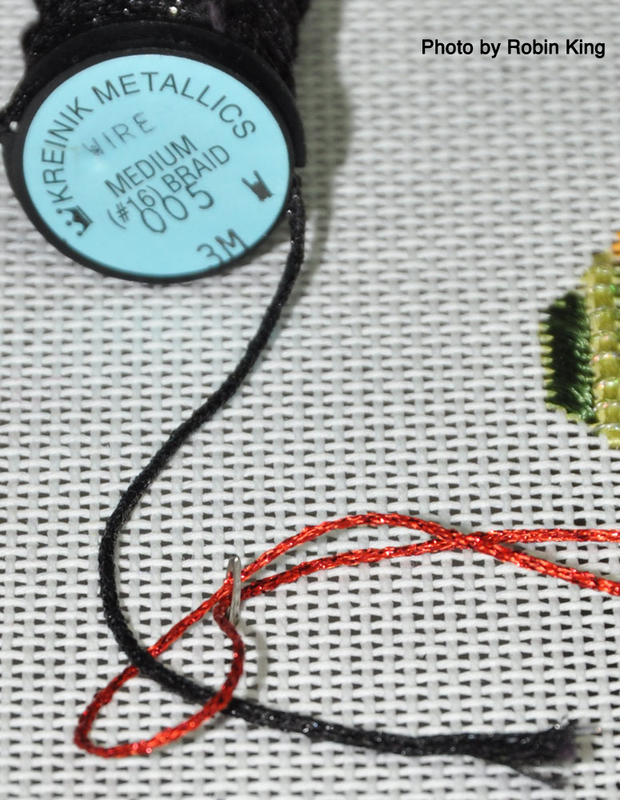 Here's the link to the Kreinik website so you can see the 9 colors. You all know I have successfully used (as seen on this blog) the DMC Memory Thread. It's good stuff... now with even more colors. 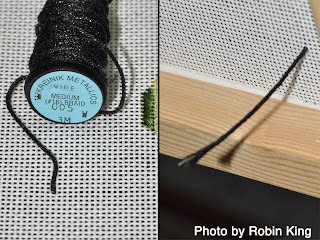 I'd like to share with you one method of inserting the Kreinik Hot-Wire into your canvas. 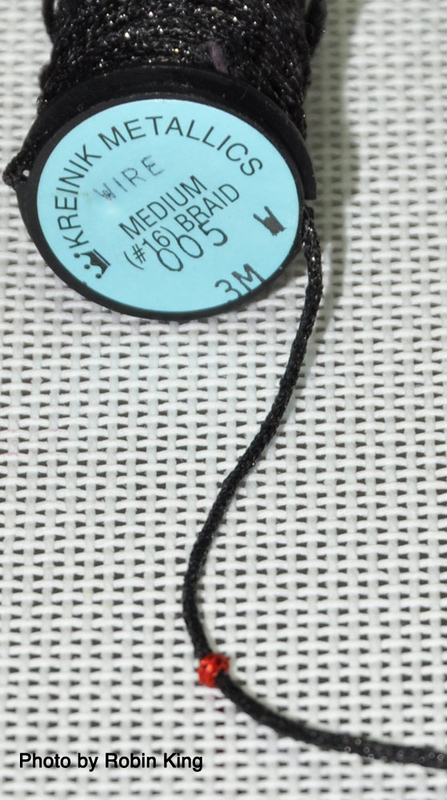 Because it is size 16 Braid with a thin wired core, you might have a bit of difficulty poking it through the canvas; especially through areas with surrounded stitching. This method worked for me; hope it will be helpful for you. The method I used was the Lasso Method. First, I put on my Cowboy Boots, Cowboy Hat, and got the Lariat handy. (Just kidding... wanted to see if you were paying attention.) But, I did make a Lariat of sorts. Here are some photos of the process I did. I made an enlarged hole in the canvas with my Laying Tool. 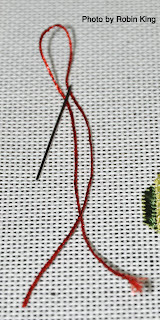 Then I took a strong thread and threaded it into the needle; making a Lariat. 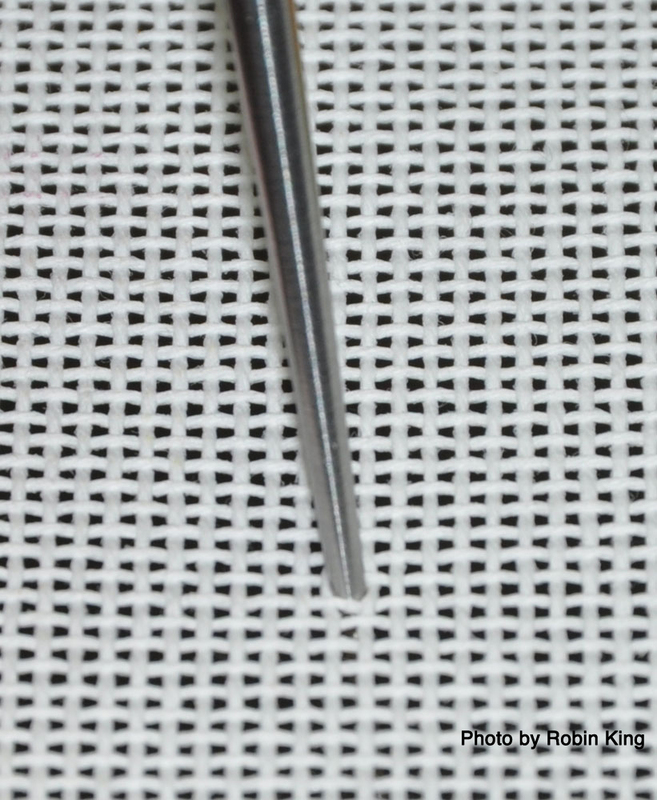 Notice the Loop End is close to the Eye of the needle. 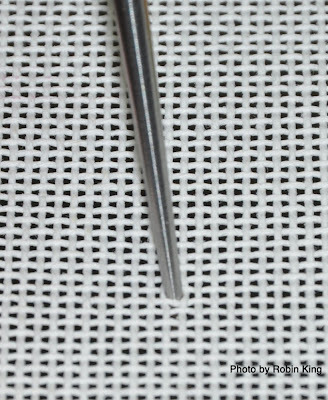 Then I put the Needle into the canvas. 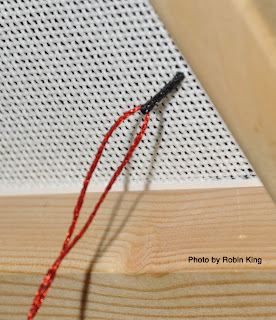 Placed the Kreinik Hot-Wire into the Lariat. 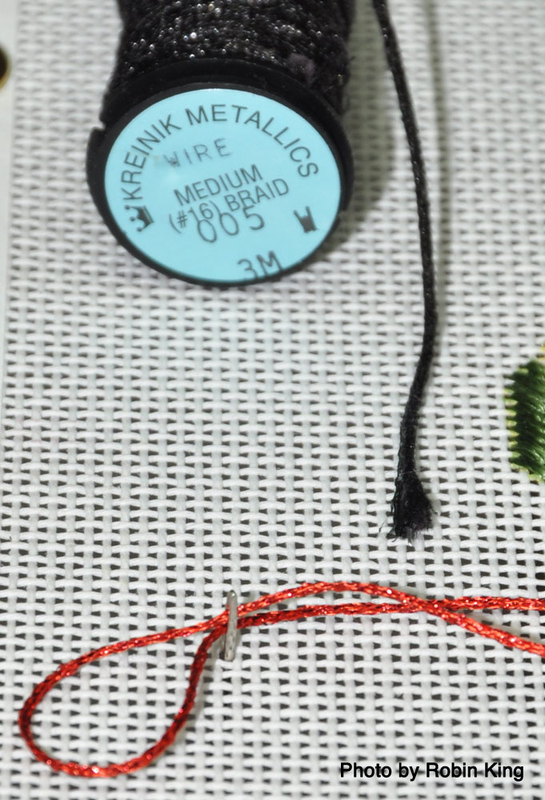 Gently tugged on the ends of the Lariat which pulled the end of the Kreinik Hot-Wire through the canvas. Here is a photo from the back of the canvas. 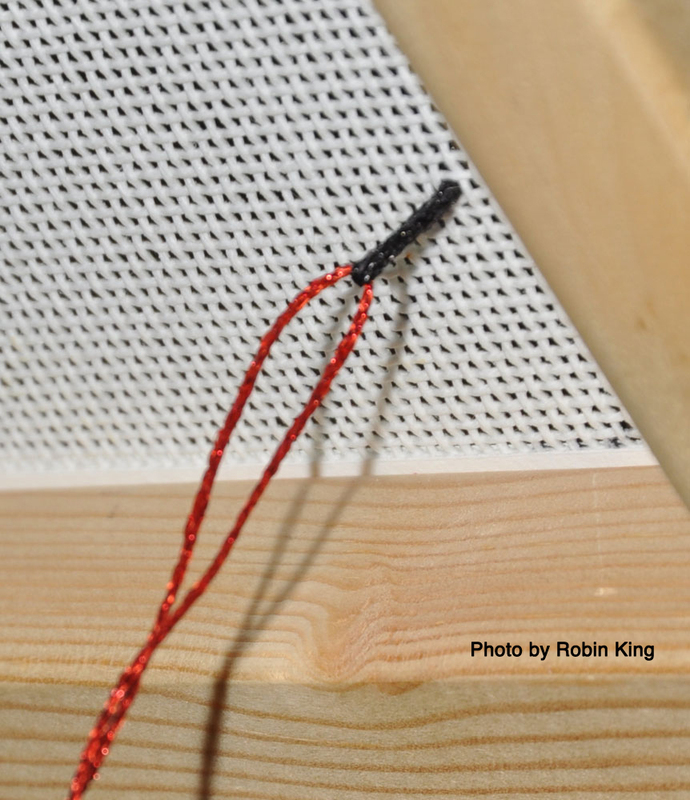 The Kreinik Hot-Wire is now pulled through. 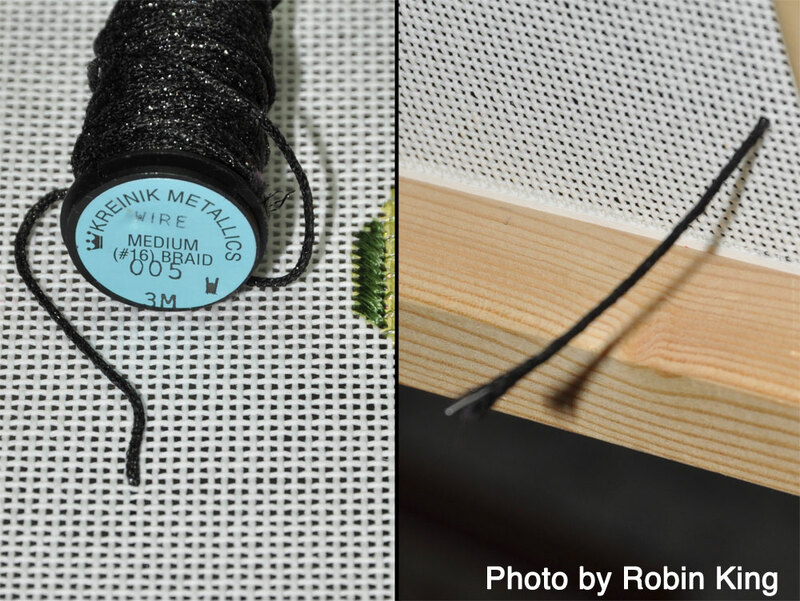 From there, you would whip-stitch and secure the cut end of the Kreinik Hot-Wire to the back of the canvas. The directions for the top section of the lid calls for us to place the green beads first. The only problem is that there are no green threads. 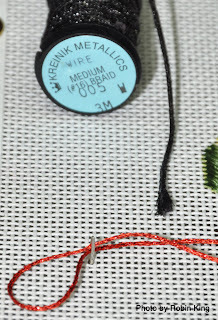 After consulting the picture, I have decided to put a green bead below the black thread which is below the purple triangles. Green section on Sarcophagus lid. Here is the green section of the Sarcophagus. It is a bit hard to see the pattern. 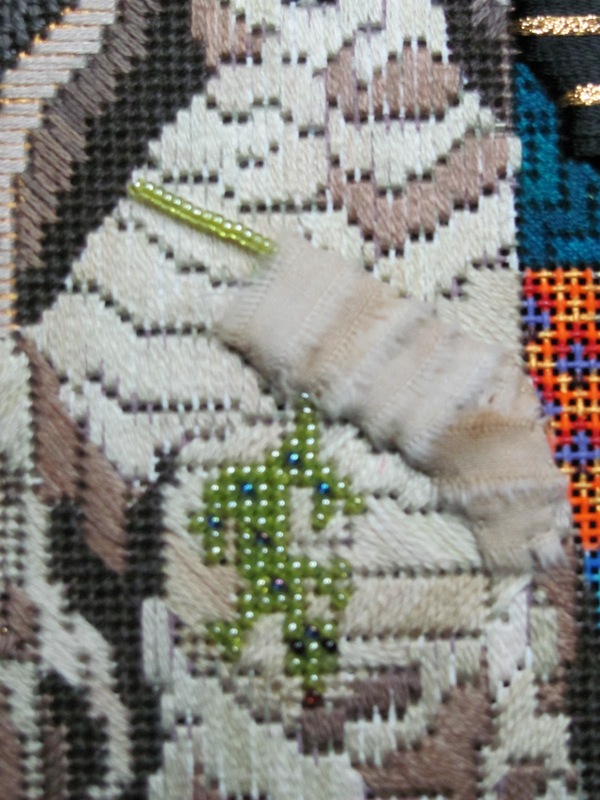 The grey threads are for the darkest green bead, then the middle green threads are for the medium green beads. The lightest areas are for the same green used on the gecko in the mummy's hand. I can only imagine how difficult this canvas was to paint. 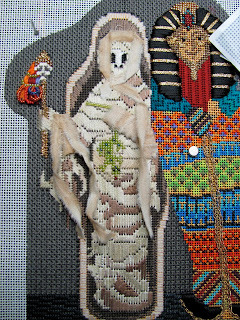 The beads are a great statement and would dominate the canvas if Amy had not added the strips to the mummy. I'm loving the beading. 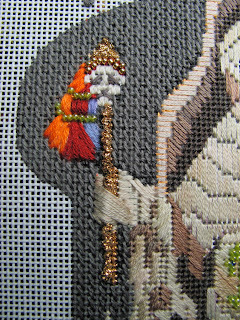 Remember, you are doing basketweave but with a bead on each stitch. So easy! Before we talk about the new toy, we will look at the bottom of the sarcophagus. I did not enjoy this part. With practice I finally got it...sort of. I learned to push the current string of beads up into the previous row, like a zipper. to the left, (which was done with the canvas at a 90 degree turn). So here we are, ready to stitch bead the rest of the sarcophagus. to the top of the beast. Here is the new toy! This disc has a magnet on the bottom and a tacky surface on the top. What a wonderful way to have your beads handy. Amy and Jill ordered this toy at market. Hopefully they will arrive at the shop soon. Here are my boys making sure I don't drop any beads. I have gathered the materials to dress the Mummy. He wants to get his arm free so he can grab the gecko. A little muslin gives him an arm. I added the gecko's tail after attaching the arm. 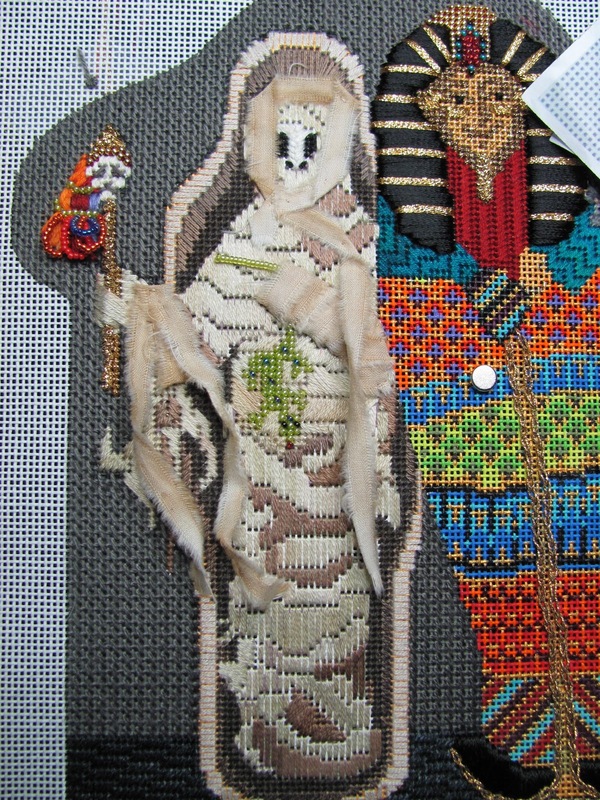 I believe this mummy is done! Now on to the top of the Sarcophagus. Lots of beads are in my future. I had to read the directions three times before I figured out that the tassel on the skull stick should have two green lines to separate the tassel into three parts. So I drew a mark where the top green line probably was on Amy's canvas. I stitched the top layer and began to pad the second. 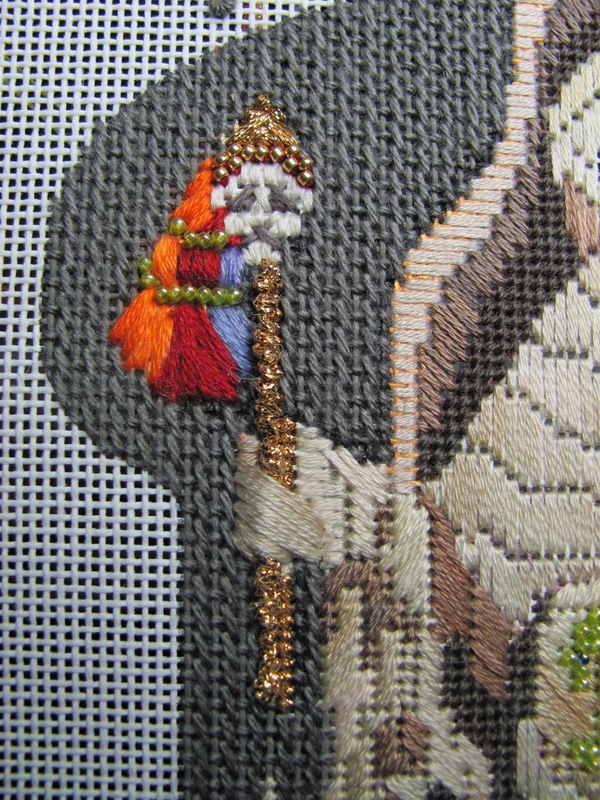 I then finished the tassel as in the guide. I used the wrong blue, but I am going to leave it in. 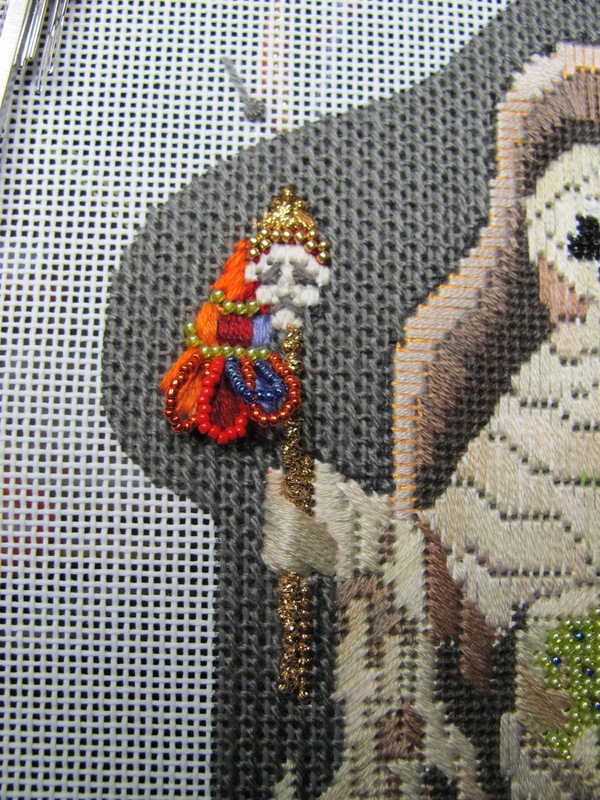 And now the beads are between each section. The next step was to couch a thicker stick and add the Mummy's fingers holding the stick. 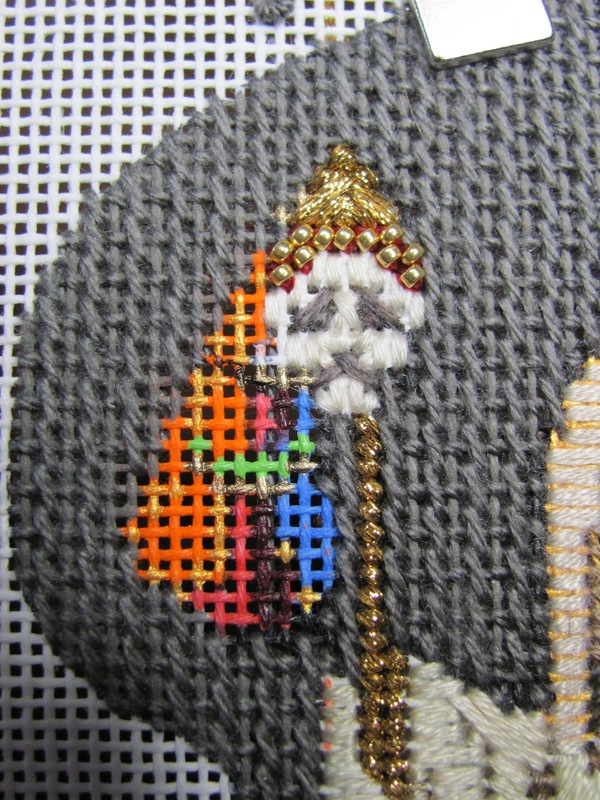 And it was fun to add the loops of beads. If you want the beads on top of the Sarcophagus to be just like Amy's, then go by her chart and stitch them BEFORE you stitch the big head. Otherwise just go by the painted canvas as I did. 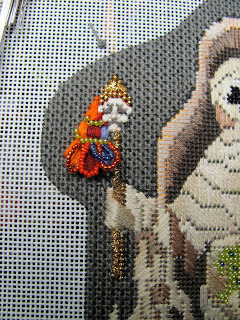 I was very pleased to get the beads in until I saw a that I had used the wrong red beads. That's better! I haven't decided if I will add the second layer of gold beads on top. He looks very regal to me! My next step with the sarcophagus is to put some "trim" around the bottom and up the middle. 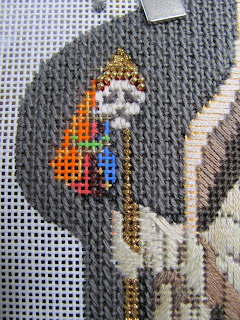 And so I can finally add the metallic trim on top and bottom of the two color border. I moved back over to the head of the Sarcophagus. I don't know why I jump around like I do. But it seems to be working. 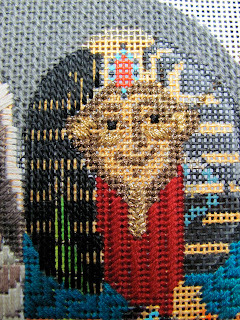 Amy's stitch selection and thread give this guy a great look. And it is simple to do. Follow her tip to complete one full side before going to the other side. Here is the left side finished. And here is his big head finished. Now move down and do the same thing at the bottom of the sarcophagus. I must admit that I had to do this section twice. I made them to big on the first try. I didn't leave enough room in the center. We will fill this in later. The skull on a stick.